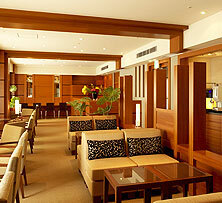 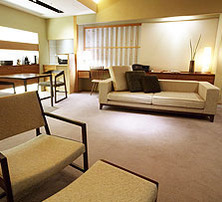 The perfect embodiment of Kyoto elegance, comfort and style! 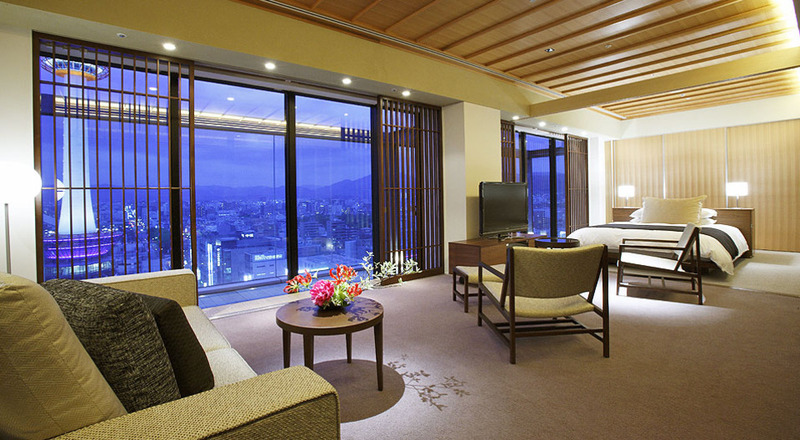 From our magnificent new 15th floor Choraku Suite, enjoy commanding views of the ancient city as you relax in the refined luxurious surroundings that embody the best of Kyoto’s traditional sense of style and comfort. 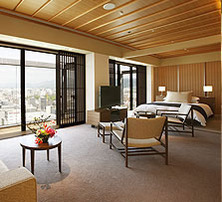 The Choraku Suite was created by a famed Kyoto interior designer who has fashioned guest quarters that reflect the Imperial elegance of traditional Kyoto design and living styles. 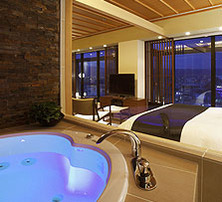 This new, one-of-a-kind 73sqm suite not only offers stylish luxury and comfort but also features floor to ceiling windows and even offers you the opportunity to step out onto an open air veranda from which you can enjoy magnificent views of the city. 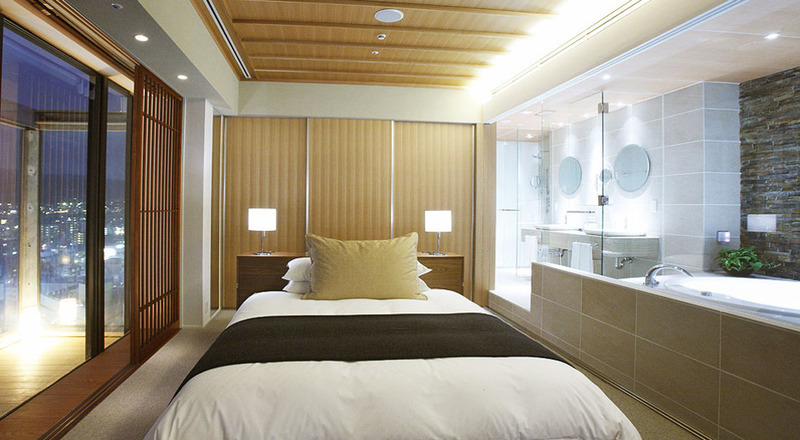 There are traditional Japanese sliding doors to divide the parlor, bed room and bathroom. 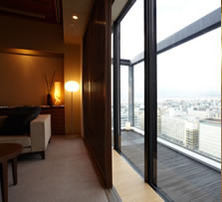 Private balcony with Hinoki cypress flooring to explore sweeping city view. 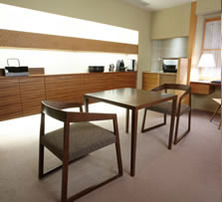 Dining area equipped with microwave, refrigerator and compact sink. 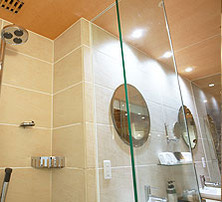 Separate shower booth with an innovative multi-function shower that includes overhead, body and handheld shower heads for a relaxing, invigorating bathing experience.The relaxation and massage features enable our guests to greet the new day and because the full-volume hot water spray envelopes the entire body, a short shower can be as effective as a long bath in leaving the body feeling refreshed. 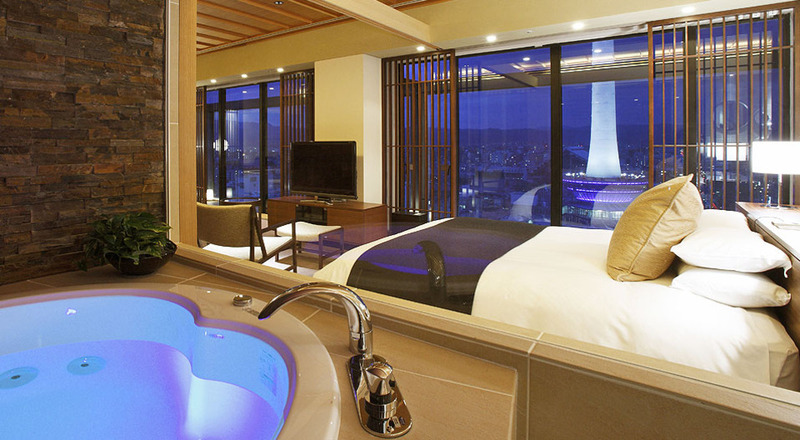 Stylishly designed lavatory with a waterproof one seg TV. 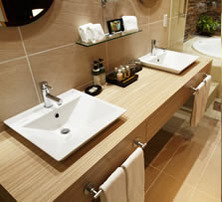 Detaille la maison (shampoo, conditioner, body-soap, body lotion, and bath gel) and Hahonico (makeup remover and facial soap) are provided in all suite rooms.